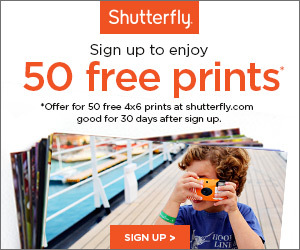 $10 OFF Any $10 Purchase Shutterfly Coupon + 10 FREE Cards (Shipping Starts at $2)! You are here: Home / FREEbies / $10 OFF Any $10 Purchase Shutterfly Coupon + 10 FREE Cards (Shipping Starts at $2)! This fab coupon offer ends tonight at 10pm PST! You can snag $10 OFF Any $10 Purchase at Shutterfly with coupon code 10DOLLARS at checkout! And, through 10/20, you can snag 10 FREE Personalized Cards with code GREETINGS at checkout! All you pay is shipping which starts at less than $2! Please note that you cannot use both codes in one transaction, however, both of these offers are available to both new and returning customers! With deals like these, you can snag the perfect gift! Create a personalized magnet for the grandparents, and finally get that perfect shot printed! And get those holiday cards created early for all the special people in your life! Don’t let these deals pass you by …..